Cricket has often been an instrument of change in Indian society. And post India's 1983 World Cup win, it became a symbol of a young nation's efforts to gain importance on a global stage. That triumph gave many youngsters a purpose in life and cricket became an obsession. The sport was already popular in the city of Mumbai, which had produced some of the country's finest batsmen till then. One of them had established himself as one of the finest in the world, Sunil Gavaskar. A young boy was rising through the ranks of school and age group cricket like a tornado, his talent was inimitable and his resolve was stronger than what you see in boys of his age. His only dream was to play cricket for his country and one day, hold aloft the World Cup, just like his idols. Sachin Ramesh Tendulkar, son of a Marathi poet and professor, became the talk of the town in Mumbai cricketing circles due to his prodigious talent. Tales of his exploits while playing for his school team, Shardashram Vidyamandir, became famous and soon he made the cut for the Mumbai Ranji team. Tendulkar shone bright at the bigger stage too, scoring centuries on debut in Ranji Trophy, Deodhar Trophy, Duleep Trophy and Irani Trophy. But his international debut against arch-rivals Pakistan didn't go according to plan. But the youngster did enough on that tour to prove that he belonged at the international arena. Centuries in England and Australia further helped him stamp his quality at the global stage and Tendulkar soon became the Indian team's pivot. But it was his rise to the opening slot in one-day international cricket, that changed Tendulkar's career forever. It gave him the license to bat with gay abandon, and Sachin started becoming a phenomenon. He was soon the saviour for a team which was at best mediocre in terms of talent. Tendulkar's moment came when India co-hosted the 1996 World Cup. He set the stage on fire with one quality knock after another, but despite being the highest run-getter, Tendulkar couldn't fulfill his dream as India lost in the semi-final. In the years that followed, Tendulkar emerged as the world's best batsman, with even the greatest ever, Sir Donald Bradman, acknowledging his greatness. At the turn of the century, a new crop of Indian cricketers started proving their mettle and India's dependence on Tendulkar started diminishing, but he still continued to be India's crown jewel. A career-threatening 'tennis elbow' injury slowed down his career but the master came back with vengeance. Tendulkar started enjoying his cricket more as he was now part of a team that was winning world over. His desire to be crowned world champion suffered a heartbreak in 2003 as India lost in the final to a rampant Australia. 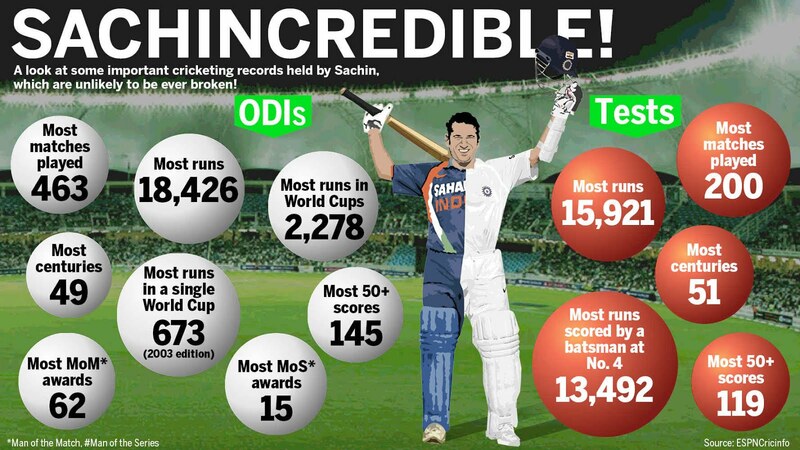 Sachin was once again the highest run-getter. In 2007, India were shown the door in the group phase of the World Cup and it looked like Tendulkar's desire to win a World Cup title will remain unfulfilled. Tendulkar though continued and kept dominating the cricketing world, contributing to the cause of Indian cricket. By the time India co-hosted the World Cup again in 2011, he had all the batting records in his bag, but the biggest prize of them all was up for grabs, perhaps one last time. Tendulkar scored two centuries in the group stage, one of the matches was tied while India lost the other. A semi-final clash against arch-rivals Pakistan saw Tendulkar show great maturity and bat sensibly to help the team set up a challenging total, which eventually turned out to be a winning one. The final at his home ground in Mumbai was a great opportunity for Tendulkar to win the Cup of joy on his own but he failed. But the job was done for him by Gautam Gambhir and MS Dhoni and India won the World Cup, for Sachin Tendulkar. The legend was carried on the shoulders by his teammates as he soaked in the applause from a packed Wankhede stadium. After 22 long years of starting his journey as an international cricketer, Tendulkar was finally a 'World Champion'. Six years and 22 days later, Sachin Tendulkar turns 44 years old, pretty much a retired cricketer now. But he remains a world champion.